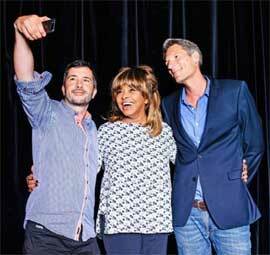 At first Tina Turner, 74, shows us her villa in Küsnacht at the Zurichsee. The "Simply the Best" singer lives here from 1984 with her husband and musicmanager Erwin Bach, 58. She has retired from showbusiness and is with more than 100 million sold albums one of the most successfull singers ever. Now the citizen of Switzerland is enjoying her retirement, she discovers the new country where she lives now and she lears how to speak German. 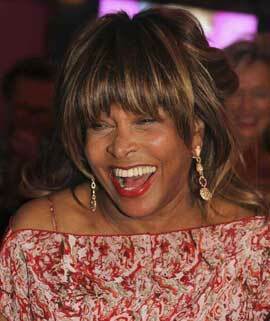 TT: (in German now) I am Anna Mae Bullock, but my artist name is Tina Turner. Good evening (laughs) But I speak more German than that of course. TT: Yes I already did that. I want to know what is happening in this country, how the democracy works. I am Swiss and therefore I am interested in what the Swiss people thinks and feels. I decided to abandon the American passport and to live here. I learn every day new things about what it means to be Swiss. And I ask a lot, watch and listen. TT: I love the fresh air. It makes me feel healthy. You don't have smog here or air pollution. And I love the different seasons. I don't like the heat very much, because I grew up in hot tennessee. And there is was very very hot! TT: The fall with all his different colours and the colours of the leaves. And with the fall the quietude starts. And the Zurichsee is then very calm, very beautiful. I can relax then and love it to simply watch the water. TT: Preactically all of them. Yes I really have visited fast all of them! And each one is unique in its own way. And so different from the American cities. I love them. But living is the best around Zurich for me. TT: I love the cheese. Amd I love Bürli. But I can't eat too much from it. I have to watch my figure a bit. But most of the time I eat what I want to. The Swiss cuisine is not so different from the cuisine in the southern states of America. They eat lots of cheese, potatoes and vegetables there too. TT: The cows! (laughs) We had cows in Tennessee too, but the brown cows really look “special�? here. I really like it how they are brought down from the Alps with their bells around the necks. That’s like a ceremony. And punctuality! This is so different from most of the US celebrities! This does not work here! Somebody told me at a party once: I know you are famous, but you have to be on time! I had to work on that and nowadays I am always on time! Did you write a SMS before? TT: I am not a heavy user but I write SMS now and then, sometimes I send photos to my friends or to my sister in USA. My favorite is to call with iO. With iO it is very easy, because it is all in the same app. But these smartphones are unbelievable, they can do anything, and I find out new stuff often. TT: I have the best ringtone there is! “Simply the best", but I Yodel. I hear that when somebody with IO calls me. Everybody that downloads IO can get this ringtone. And you can hear the youdelversion also in the Swisscom commercial. Did you already see it? TT: No, not really. You have to know the technique to do that. I have to learn that. It is like Aerobics for the voice! A professional yodel artist did the yodel for me on the commercial. TT: yes I have! You have to do that with a special technique and very much power, so that the tone gets out. But I did it! At my wedding I also had Alphornplayers. Very Swiss! TT: Yes through the radio and also through the News shows on TV. My husband and I often watch the news in the evening. TT: I had lived in germany already for 3 years before that. Than my husband got a job in Switzerland. I already did several concerts here and then all of a sudden, we werer searching for a house here. From the beginning I really loved it here. The fresh air, the green land. Everything is so clean and organised very well. And quiet. I love that very much. TT: I was very young when I got these awards and I was very proud of it. All my rooms were full with these trophies. Then I visited another artist and there the tropies were in the garage. It looked beautiful and was done with the utmost respect. I thought it was a great idea. And the Grammys are in my livingroom, because they fit easily there and also fit my decorations very well. TT: Yes that is right. It is a small room in which it is very quiet. I only pray there. There are several Buddhist elements in there, like a Butsudan, a shrine with water bowl, incense and fruits. I kneel there to pray. And the shrine is a refection of yourself, of your life. TT: I stay up pretty late, because I still have my showbusiness rhythm. Then I worked at night and slept during the day. And I still like that very much! I have breakfast at 14 hr. (2 pm) and I take all the time for it. You can call it a lazy lifestyle! I love it. I started working when I was 20 and now I am retired and I can do whatever I want professionally. Or I just relax and live my life. TT: No I am not a jeans girl. I don't like the fabric of jeans. So I only wear jeans now and then. I like flowing and easy fabrics and outfits. And I want to look good for my husband of course. And also for guests, that sometimes visit me without prior notice. Is there anything that you don't like in Switzerland? 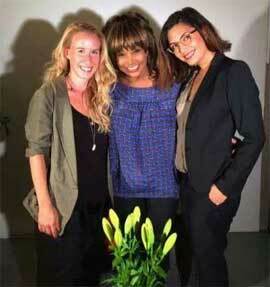 TT: Before I decided to give up my American passport I learned a lot of Switzerland. So I was 100% certain that I wanted to live here and that I wanted to become a Swiss citizen! There is nothing that I don't like. I travelled all over the world and I consciously decided to live here. And I made the right decision. I arrived here.